Chris Abraham is a master of the digital marketing field. He’s considered a pioneer in the realms of content marketing, online collaboration, blogging, and consumer-generated media, all of which he practiced in the ‘90s. His expertise in online marketing garnered him a place among Forbes’ Top 50 Social Media Power Influencers in 2012. He also runs his own media marketing agency called Gerris. 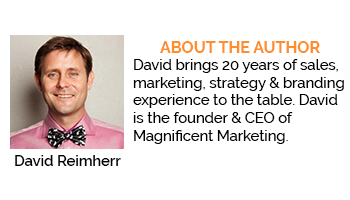 Sitting down with Dave Reimherr from Magnificent Marketing, Chris discusses a variety of topics surrounding digital marketing. These include earned media, how PR models have changed and micro influencers. Chris describes earned media as value-based media where a story is pitched to an editorial team, who may or may not choose to write about it. It could result in a review, a social media post or some other form of editorial content. This kind of practice fits firmly in the traditional public relations model, as it allows the influencer to get a product’s information out while remaining neutral, as opposed to simply running an ad. Offline examples of earned media could include anyone who’s “in the know.” For instance, if a kid at school shows up with a handheld gaming device, and other kids notice both the entertainment value of the device and its ability to garner its user a circle of admirers, they will be more likely to purchase the device. This kind of earned media is essentially the “tail” of the marketing chain, as Chris puts it. While the marketer has no immediate influence on one kid coveting another kid’s device, it’s his or her job to plant the seeds that eventually lead to that moment. Who Are Micro Influencers and How Do You Reach Them? As the name suggests, micro influencers are people who have small but loyal followings. These could be YouTubers who have only about a thousand subscribers. Part of Chris’ job is to make his product interesting to these people, but not push it upon them, so it’s more of a natural endorsement than a sponsorship. While these micro influencers aren’t Lebron James or Leonardo DiCaprio, there are many of them and their combined reach can be quite impressive. Before reaching out to any micro influencers, Chris recommends keeping these things in mind. 1. What’s Your Point of Pain? First, he wants to know how far the client is willing to go in reaching out to micro influencers. This is important because micro influencers need to feel spoiled. And if the client isn’t willing to do that, then it might be better to just abort the mission. Chris refers to a marketing campaign for the Harry Potter books before they really took off. The publisher sent out free books to certain influencers, but some books were better than others. This created a feeling of inadequacy among certain micro influencers, which ended up created bad feelings around the books themselves. Because people receive so much junk email and other bad advertisements, they’re primed to refuse anything that smells even remotely of marketing. For this reason, Chris finds great value in persistence. This doesn’t mean be annoying; you should always remain gentle and personable. A large part of gathering someone’s trust is to show them respect. For instance, throwing a crumpled ten-dollar bill at someone is unlikely to gain you any respect from that person. However, if you give them a lovely, ornate pot of jam of the same value, they’re far more likely to have a good feeling about you. A large part of this process involves the humanization of marketing. While automated messages can get your foot in the door, follow-up messages should be personally written for maximum effectiveness. Chris prioritizes thinking outside the box and casting a wide net when searching for micro influencers. For instance, when it comes to running shoes, Chris doesn’t only think of serious runners. He thinks of anyone who’s trying to lose a couple of pounds or get back in shape. It’s important to not let your client draw a definitive line around who you should target, as products can have a variety of uses that clients won’t even think about. First of all, when attempting to market by way of a message board, Chris recommends absolute transparency. Pretending to be someone else and covertly recommending a product is a dead-end street. He also recommends sparsity for your content. Instead of using a weekend to send out hundreds of private Facebook messages, take what you come up with and work them into an “editorial calendar.” Otherwise, overflowing a site with content will result in the site’s algorithms working against you. Chris conducts research by coming up with a series of keywords based on whatever product he’s marketing. Then, he feeds those keywords to a team in India, who then find sites and blogs that can elucidate the product and how it might best be marketed. However, this doesn’t mean that Chris doesn’t do the research himself. Before sending his Indian team out on the hunt, he does a fair bit of front-end work. The first thousand influencers can be found with simply a weekend of hard work. Doing this work himself before passing it on to a larger team allows Chris to develop a first-hand knowledge of what’s out there. Where Can You Learn More About Chris Abraham? Chris has a blog on Biznology.com, which he updates every Tuesday with his large swath of marketing know-how. He also has his own personal website, ChrisAbraham.com, and a corporate website, Gerriscorp.com. He can be reached on all of the social media platforms, including Twitter, Facebook, and LinkedIn. If you reach out to him, he will do his best to respond. Remember, you don’t have to take “no” for an answer, but be friendly. Chris Abraham, digital strategist and technologist, is a leading expert in digital: earned-media micro-influencer marketing, search engine optimization (SEO), online relationship management (ORM), Internet privacy, Wikipedia curation, social media strategy, and online public relations with a focus on blogger outreach, influencer engagement, and Internet crisis response, with the digital PR and social media marketing agency Gerris digital.